I got my GSI Hae Tea Kettle in today that I ordered from REI a few days ago. I got this kettle to use with my Original White Box stove for a light-weight set up for 2. This is my first kettle, so I was excited to get it in, since I have heard so much about kettles. A few things about the kettle. It is made of GSI’s Halulite, which is a hard-anodized alloy that distributes heat evenly which promotes a faster, more efficient burn. Also, GSI claims that their Halulite is scratch and abrasion resistant. The kettle features a single uncovered pour spout on one side, and a ld that is able to be completely removed. The lid has a single silicone-coated loop atop it which allows te lid to be removed without burning my fingers in the process. It also features a single handle which is also silicone-coated and has a single nook in which the kettle can hang evenly from. The handle will swivel side to side to allow for easy storage. My thoughts so far. The kettle is listed at 5.5 oz, however on my scales it shows 5.9 oz. The lid seats great in the kettle, however it does not fit tightly, so it will simply fall off once the kettle is turned over so far. This means for storage I will have to create a way to keep it held together, especially if I store my stove and other stuff inside it. This could also be a problem when pouring the last bit of water out of the kettle, unless I just completely remove the lid before pouring. And I have noticed that the lid can be a bit difficult to remove when the handle is in the upright position. The handles arch inwards and the lid hits the handles while trying to lift the lid up. Don’t get me wrong. These things can be remedied, and probably fairly easily. While I cannot do anything about the weight (which is the only truly disappointing thing about the kettle so far) I can make slight modifications to the other matters. So, overall, so far I really do like the kettle, and am planning on using it on a 3-day trip with my son and I on Memorial Day weekend. I have faith in the little kettle. I did a practice burn with the kettle once I got it today. I did use the Original White Box stove, and the heat reflector and windscreen that came with the stove. I also used 1 oz of HEET (yellow bottle). I filled the kettle with 3 cups of cold tap water. I lite the stove and waited for it to blossom, and then gave it another 15 – 20 seconds to be sure it was warmed up. From the time I put the kettle on till the time the water achieved a full rolling boil was exactly 10 minutes, and just at the 11 1/2 minute mark the stove burnt out. After this, later on I decided to do one more run at it. I used the same type and amount of fuel in the same stove, with the same set-up and the same amount of water in the same kettle. However, what I did this time was open the windscreen as far as I could while still being attached with a paper clip at the ends. The first time it was nearly all the way opened, but not quite all the way. The first time the distance between the kettle and the windscreen varied between 1/4″ – 1/2″ (this is because the windscreen is not perfectly shaped in a circle – it’s aluminum so I do the best I can!). The second time the variations were between 1/2″ – 3/4″. The burn times were quite a bit faster, this time beginning a boil at ~ 6 minutes and 25 seconds, and maintaining a full rolling boil at 7 minutes, but also its burn out time was quicker, at ~ 9 minutes and 35 seconds. So, this is what I know so far on the Kettle. I definitely plan on using it much more, and will post a full report on it when I do so. Video Update: So, not much new to add here on the GSI Kettle from my previous write up about it, but I did just want to add a video showing the stuff sack that I made to use with the kettle, and show some of the stuff I will use inside it, and how well it packs up. So, hope you enjoy the video. 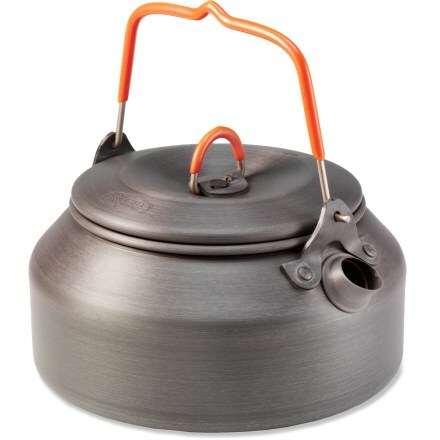 #1: GSI Kettle with Optimus Crux Stove & no windscreen. I used a 4 oz Jetboil fuel canister that had previously been used, but not much out of the canister. The canister weighed 5.1 oz (145 g) before boiling. This stove brought the 2 cups of water to a full rolling boil in 1 minute and 55 seconds. The stove was turned up half way. After the boil, the fuel canister weighed 4.8 oz (138 g). So 2 minutes and 0.3 oz (7 g) for a boil is pretty sweet, and efficient. #2: GSI Kettle with the Original White Box Stove & heat reflector. No windscreen was used with this test. I used 1/2 oz of HEET (yellow bottle), and a few drops in the primer pan to help the stove blossom faster. Begin Boil: Did not begin to boil. Full Rolling Boil: Did not come to a boil. Stove Burn Out: 5 minutes & 4 seconds. #3: GSI Kettle with the Original White Box Stove, heat reflector and the windscreen was used with this test. I used 1/2 oz of HEET (yellow bottle), and a few drops in the primer pan to help the stove blossom faster. Begin Boil: 5 minutes & 27 seconds. Full Rolling Boil: Did not achieve a full rolling boil. Stove Burn Out: 6 minutes & 18 seconds. #4: GSI Kettle with the Original White Box Stove, heat reflector and the windscreen was used with this test. I used 3/4 oz of HEET (yellow bottle), and a few drops in the primer pan to help the stove blossom faster. Begin Boil: 5 minutes & 14 seconds. Full Rolling Boil: 6 minutes & 8 seconds. Stove Burn Out: 8 minutes & 48 seconds. Of course this was in a controlled environment, free from any wind and in a room about 68 – 70* F. However, the canister stove was just fast & efficient. For long trips, this would be an excellent set up. As for the WBS, even in a controlled environment the windscreen made a difference. Without the windscreen, 1/2 an oz did not even bring the 2 cups of water to a boil. With the windscreen, using the same amount of fuel and water, the WBS efficiency was increased 2 ways. 1. It actually retained more heat and brought the water to a boil, and 2. It increased the overall burn time. What is also interesting is that while the 1/2 oz of fuel did in fact bring the 2 cups of water to a boil just by adding the windscreen, by the time the water was at a boil, the fuel was getting low and the flame was dying down. Because of this, the water never actually reached a full rolling boil. However, when I added just a little more fuel (3/4 oz) and kept the windscreen and heat reflector in place there was enough to bring the water to a minimal boil, and there was still enough fuel to burn hot enough long enough to continue heating the water, bringing the water to a full rolling boil. It even maintained that full boil for about 2 1/2 minutes. So, 5-6 minutes for a good boil using the White Box alcohol stove. While it is not < 2 minutes, it is still not a long time. I guess it just depends on how hungry you really are! I will be happy to carry this stove with me. I have 3 trips I am going to do by the end of June (each of them lasting 3 days), and I will bring this exact set-up for each one. I will be sure to report back on how it does in the field after these trips. Update: I have written a review on the kettle and posted it to Backpackgeartest.org. My full report on the Tea Kettle can be read here. Thanks for your presentation concerning the GSI tea kettle & the white stove. I just bought the tea ketlle and placed the order for the white box stove. I should get next week. It will be my first alcohol stove. Looking forward to lightening my pack load. Glad I could help. This really is a great set-up. Might I also suggest cutting the bottom of a 12 oz coke can to use as a snuffer. Just cut it tall enough so that when inverted and set on top of the stove that it goes just past the jets. Mine weighs in at 5 gm but it is very useful. I found that when using the snuffer it is ok for me to add a little extra fuel. By adding a little extra fuel then I can be sure that there is enough to bring the water to a boil regardless of conditions (temperature of water and wind). Then once the water is boiling I simply snuff the stove out. Leave the snuffer on top of the stove and once it is cooled down hold the snuffer in place and turn the stove upside down. All of the remaining fuel will spill out into the snuffer. Then just carefully pour the unused fuel back in your bottle. Also, I have always used HEET. It is what Bill recommends and just simply what I buy. I can buy SLX, but jsut ahve the habit to buy the HEET. I did buy a fifth of Evberclear (190) and have used that. It works fine to, but due to the small amount of water I have that in some stoves (Mini Atomic) it did not burn as clean and turned the bottom of one of my beer can cook pots black. Anyway, thanks for stopping by and commenting. And enjoy your new gear! I’ve been debating about getting a kettle as well. Well, while in Nashville for Christmas, I picked one up at REI. I got the kit that came with the 2 cup/bowls, spork and stuff sack. I am finding that I am ‘cooking’ less and just boiling water for Mntn Hse type meals and bevergaes as well. GSI claims it holds 1L; and, it will, but the kettle is filled completely to tip of the spout. For practical use, it seems 3-3.5 cups of water is it’s realistic maximum volume. And, a bonus, since we do not have a kettle for the kitchen at home, it will get some double use. I’ve only used it with my Pocket Rocket for now and plan to mess around with the alcohol stoves I have on hand. I enjoy your blog as usaul, good information. I have found the same to be true of my kettles capacity as well. I usually just fill mine until the water is just below the bottom of the spout on the inside and it is usually enough. So, thanks for checking out my blog and leaving a comment, and congrats on the new piece of gear!